THE PRESIDENT: Good morning, everybody. As many people know, our current Ambassador to China, Jon Huntsman, has decided to step down from his current job. During his tenure, Jon has been an outstanding advocate for this administration and for this country. He made a real sacrifice in moving his family out of the state that they loved and has helped to strengthen our critical relationship with the Chinese government and the Chinese people. And so I am very grateful for his service. In replacing Ambassador Huntsman, I can think of nobody who is more qualified than Gary Locke. More than 100 years ago, Gary’s grandfather left China on a steamship bound for America, where he worked as a domestic servant in Washington State. A century later, his grandson will return to China as America’s top diplomat. In the years between these milestones, Gary has distinguished himself as one of our nation’s most respected and admired public servants. As our country’s first Chinese-American governor, he worked tirelessly to attract jobs and businesses to Washington State, and he doubled exports to China. Two years ago, I asked Gary to continue this work as Commerce Secretary. I wanted him to advocate for America’s businesses and American exports all around the world, make progress on our relationship with China, and use the management skills he developed as governor to reform a complex and sprawling agency. He has done all that and more. He’s been a point person for my National Export Initiative, and last year, Gary’s department led an historic number of trade missions that helped promote American businesses and support American jobs. He’s overseen an increase in American exports, and particularly exports to China, a country we recently signed trade deals with that will support 235,000 American jobs. As Commerce Secretary, Gary oversaw a Census process that ended on time and under budget, returning $2 billion to American taxpayers. He’s earned the trust of business leaders across America by listening to their concerns, making it easier for them to export their goods abroad, and dramatically reducing the time it takes to get a patent. When he’s in Beijing, I know that American companies will be able to count on him to represent their interests in front of China’s top leaders. As one of the world’s fastest-growing economies, our relationship with China is one of the most critical of the 21st century. Over the last two years we worked hard to build a relationship that serves our national interest -– addressing global security issues and expanding opportunities for American companies and American workers. Continued cooperation between our countries will be good for America, it will be good for China, and it will be good for the world. As the grandson of a Chinese immigrant who went on to live the American Dream, Gary is the right person to continue this cooperation. I know he will bring the same skills and experience that he brought to Commerce Secretary to this new position that he’s about to embark on. THE PRESIDENT: Emily just turned 14 today, so I was commiserating with her as somebody who moved around a lot when I was a kid as well. I assured her it would be great 10 years from now. (Laughter.) Right now it’s probably a drag. But I’m absolutely confident that this is — we could not have better representative of the United States of America in this critical relationship than we’re going to get from the Locke family. And, Gary, I wish you all the best of luck in Beijing. Thank you so much. SECRETARY LOCKE: Thank you, Mr. President. Well, thank you very much, Mr. President. And I’m deeply humbled and honored to be chosen as your next ambassador to China. It was a little over a century ago that my grandfather first came to America to work as a houseboy for a family in the state of Washington in exchange for English lessons. And he went back to China, had a family, and so my father was also born in China, and came over as a teenager a few years later. He then enlisted in the United States Army just before the outbreak of World War II, became part of that “greatest generation,” and saw action on the beaches of Normandy and on the march to Berlin, and then came back to Seattle to raise a family and start a small business. My father never imagined that one of his children could ever serve as the Secretary of Commerce in the United States of America. And he was beaming with pride, Mr. President, the day you presided over my swearing-in ceremony. Sadly, Dad passed away this past January. But I know that if he were still alive, it would be one of his proudest moments to see his son named as the United States ambassador to his ancestral homeland. I’m going back to the birthplace of my grandfather, my father, my mom and her side of the family, and I’ll be doing so as a devoted and passionate advocate for America, the country where I was born and raised. As Commerce Secretary, I’ve helped open up foreign markets for American businesses so they can create more jobs right here in America. And I’m eager to continue that work in China and to help you, Mr. President, manage one of America’s most critical and complex diplomatic, economic, and strategic relationships. I’m excited to take on this new challenge, as is my wife and our children — to varying degrees among the kids. (Laughter.) And we’ll be leaving Washington, D.C., with great memories and many new friends. Being Commerce Secretary has been one of the best jobs I’ve ever had, thanks to the immensely talented and dedicated men and women within the Department of Commerce, in the White House, and within the Cabinet. And I’m proud of the work that we’ve done at the Commerce Department, delivering services faster, serving the needs of U.S. businesses and workers, saving taxpayers billions of dollars by being more efficient in everything that we do. And I’m confident that these accomplishments will stand the test of time. Mr. President, I’m eager to assume this new position. And it’s a privilege and a solemn responsibility to serve you and the American people as the next United States ambassador to China. Thank you for the confidence and the trust that you’ve placed in me. Thank you. THE PRESIDENT: Thank you. Thank you so much. It’ll be interesting to watch US Mission China for the next couple of years. Josh Chin in this WSJ piece points out that President Obama is “trading in a white former governor who speaks Mandarin for a Chinese-American former governor who doesn’t.” The piece also talks about perceptions and whether Mr. Locke’s ethnic background will be an advantage or a hindrance in his new job as the first Chinese-American chief of mission in Beijing. Inevitably, Mr. Locke’s story will be one more example of America as a place where anything is possible. Among its recommendations are 1) fully funding of the staffing initiative under Diplomacy 3.0, 2) creation of a 15% training float, 3) long-term commitment to investing in the professional education and training needed “to build a 21st-century diplomatic service of the United States able to meet the complex challenges and competition we face in the coming decades”; 4) strengthening and expansion of the Department of State’s professional development process ; 5) establishment of a temporary corps of roving counselors to address mentoring problems caused by the mid-level gap; 6) a study that will examine best practices in the field to determine how on-the-job training can be most effectively conducted for FSOs; 7) completion of a year of advanced study related to FSO’s career track as a requirement for promotion to the Senior Foreign Service; and 8) appropriately targeted consultations before a new Chief of Mission (COM) even begins pre-assignment consultations. You can read the whole thing below. Or you can download the abridged and full version of the report here. Do not skip the appendices. The US Foreign Service Primer in Appendix A includes the most current employment numbers as well as a quick look on promotion and the ‘up or out’ system. Appendix D includes an interesting item on the professional development in other diplomatic services. You probably already know that Chinese officers must take a leadership and management training course, along with courses on international relations, economics and finance, international history, Chinese history, protocol, and consular affairs for promotion to 2nd Secretary. But do you know that these courses apparently are taken in officers’ spare time, in addition to their normal duties? Do you know which diplomatic service requires its officers to sit for exams following a one-month course that focuses on economics, law, civil society, and politics before promotion to 1st Secretary? Or which one requires a PhD-level dissertation for promotion to Counselor? Read more below. Copyright © 2011 American Academy of Diplomacy, the Henry L. Stimson Center and the American Foreign Service Association // Republished with permission from AAD. The ICC Cricket World Cup 2011 is being played in Bangladesh, India, and Sri Lanka between February and early April 2011. 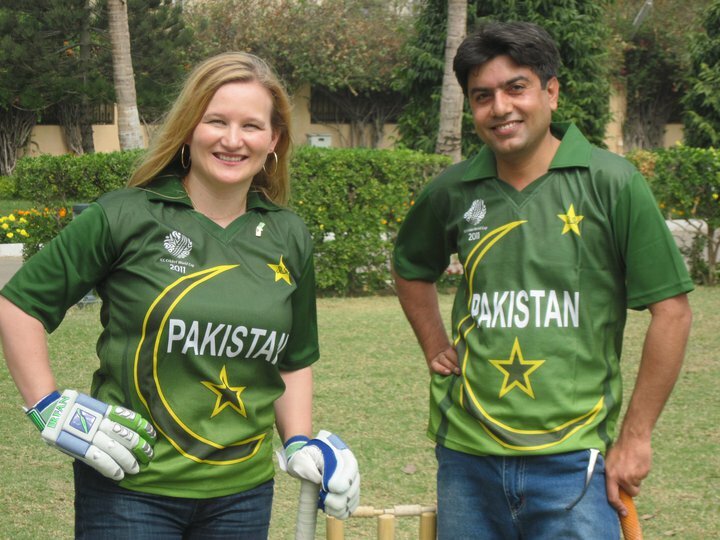 Catching on the cricket fever, the U.S. Consulate General in Karachi hosted the Youth Exchange & Study (YES) alumni for a competitive game of cricket at the CG compound. Consul General William Martin captained one team while Information Officer, Andie DeArment captained the other. The players all had spent one year living with an American family, going to an American high school, & experiencing American culture. The YES program is officially called the Kennedy-Lugar Youth Exchange and Study (YES) Program and was established in October, 2002. It is sponsored and funded by the U.S. Department of State’s Bureau of Educational and Cultural Affairs to provide scholarships for high school students (15-17 years) from countries with significant Muslim populations to spend up to one academic year in the U.S. Students live with host families, attend high school, engage in activities to learn about American society and values, acquire leadership skills, and help educate Americans about their countries and cultures. In 2007, YES Abroad was established to provide a similar experience for U.S. students (15-19 years) in selected YES countries. Read more here. If you are a family in the U.S. and interested in hosting a student from a specific country, click here.